In Palermo, we'll be staying for 4 nights at the 4-star Grand Hotel Piazza Borsa. Set in central Palermo, with easy access to Chiesa di San Francesco d'Assisi (Palermo), Oratorio di San Lorenzo and Palazzo Mirto Martorana (Santa Maria dell'Ammiraglio), Fontana Pretoria and Piazza Pretoria, this luxurious property offers numerous dining options and a panoramic roof garden where breakfast is served. The central, open courtyard is an ancient cloister and a highlight of the Grand Hotel, used as a venue for concerts and other events. In addition there is a patio, a fireplace in the lobby and tennis courts at the hotel. Leisure amenities include complimentary newspapers and coffee in the lobby, room service, sauna, steam room and a full service spa offering body and facial treatments. The fully equipped 107 rooms at the Grand Hotel come with deluxe bathrooms, air conditioning, Internet access, and luxury courtesy toiletries. 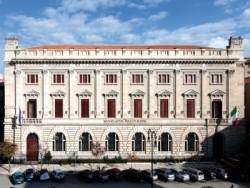 Grand Hotel Piazza Borsa is a smoke-free property. In Siracusa, we'll be staying for 5 nights at the 5-star Grand Hotel Minareto. Perfectly positioned on a headland dominated by its Red Lighthouse, bordering the crystal-clear sea, the hotel is overlooking the island of Ortigia. This perfect location allows for easy visits to Siracusa, Noto, Piazza Armerina, Modica, Ragusa, Catania, Mount Etna and Taormina. The hotel, right inside the protected marine area of the Plemmirio, has direct access to the sea with its romantic, sandy beach. Its refined and elegant amenities include a roof garden, restaurant, lobby bar, pool, spa and wellness center, and free shuttle to the Old Town. The 96 rooms of Grand Hotel Minareto are surrounded by lush vegetation of olive, carob and palm trees. Each room features Persian carpets, satin sheets, furnished private terraces, individually-controlled air conditioning with air recycling, a computer in the room with complimentary access, mini bar, safe and 32-inch LCD television.